Select from a wide variety of locally and imported Android, IPad and Computer stands and arms. Secure your tablet or computer with our quality geuine products. Our stock is constantly improving so check out idcwonline.com for our complete range of kiosks and mounts. It's stylish, slim and rugged. Add a AdvanPOS W-POS panel PC, that delivers high performance with fan-less operation, optional printer, scanner and peripherals like MSR, i-Button, fingerprint, IC card reader, RFID, Wi-Fi and Bluetooth are available for different market applications. W-POS delivers a cost effective POS solution with a high quality magnesium-aluminum display enclosure, an upgradeable PC box, and wide range of cable-less device options. Slim and powerful, our Flat Wall Mount Enclosure for larger 10” Windows/Android tablets provides a quick and cost effective method of securely presenting digital content to customers on a vertical surface. With a low profile of only 40mm from the wall surface, the key lock operated solution is ideal for use in compact installation spaces. Supporting screens of up to 25kg, the range of movements include 20 degree infinite adjustment in any direction, portrait to landscape rotation and a quick release mechanism for easy screen changing. Installation is fast and simple with a choice of VESA mounting hole patterns to increase monitor compatibility. The POS Multi Adjustable creates an individualized display, allowing you to easily mount and adjust screens up to 25kg (55lbs) to your exact height position without the need for any tools. Using the built in handgrip the pole can be effortlessly rotated and height adjusted between 12" and 17.75" (305 and 450mm), as well as 20 degree display adjustment in any direction. The Visidec Focus VF-AT wall mount combines ergonomic functionality with effortless adjustability. Its sleek and contemporary design features an elegant polished aluminium finish that will add style to any home, office or retail environment. Dramatically enhances usability of the device whilst also providing additional protection from bumps and scratches. The handle rotates 360° and allows for portrait or landscape tablet orientation and a large variety of viewing angle adjustments. 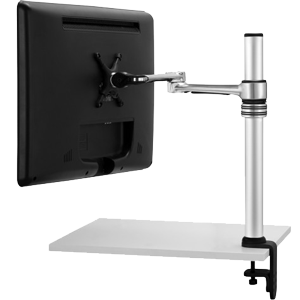 The VTB-FD flexible desk mount is the perfect mounting solution for tablet computers, including the full iPad® range. It is suitable for use with any tablet from 7" to 10" in size and weighing up to 1.2kgs (2.6lbs). It allows for fluid movement via the 500mm (19.6") long flexible shaft and can be used in both portrait and landscape mode via the rotating mounting head. It is a highly secure and rugged casing designed to protect an iPad in the most challenging public environments. It combines enhanced strength and security features with stylish presentation. The SpacePole iPad Frame can be mounted directly to any flat surface (via the use of the SpacePole DuraTile mount) or attached to a range of mounting products. Its super compact footprint and customisable options gives you the flexibility to securely mount your tablet to almost any surface and tailor your digital content delivery to your customer’s needs. A durable tablet enclosure for iPad 2, iPad 3, iPad 4, iPad Air & iPad Air 2. Ideal for displaying in public areas for example, use in receptions, school foyers, showrooms and exhibitions. Stainless steel quality solid Frame. The top is 90 degrees rotatable to allow for either Portrait or Landscape presentations. This product is also designed with security in mind, and has security screws that prevent the iPad from being removed once installed. It also has tamper resistant bolts. Brateck Anti-Theft Secure Enclosure Countertop Stand for iPad. Black and lockable with Adjustable Height Function. Designed to display your iPad securely, without threat of it being removed without your knowledge. Ideal for use in receptions, school foyers, showrooms and exhibitions.